Another awesome FREEBIE. 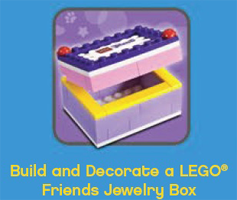 On August 1st at 5pm The Lego Store is offering this cute FREE Mini Model Build while supplies last! This event is free for children ages 6 to 14. Call ahead to see if the store is participating. Jamba Juice Kids Day – July 27th! One day only, tomorrow from 11am-4pm if you head on to a Jamba Juice you can get Free Jamba Kids™ Smoothie, up to 4 per party, child must be present. Offer valid 7/27/2013 at participating Jamba Juice stores.